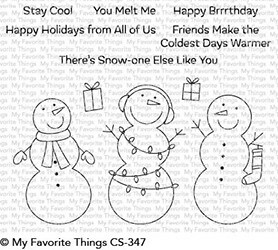 Stamps > My Favorite Things Clear Stamps "Frosty Friends"
Even if cold weather isn't your thing, you can?t deny the charm of a front-yard snowman. Giving that snowman a friend or two, or a seasonal accessory like a stocking, twinkling lights, or winter gear to keep him warm ups the appeal dramatically. This cheery trio will melt your heart (but hopefully not themselves!) throughout the winter crafting season. Clear stamp sets include the name of the set on the sticker for easy identification. Our clear stamps and Die-namics are made in the USA.